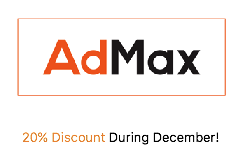 AdMax - the web directory for growing businesses in Ireland and UK in the Retail, Products, Services, Leisure, Sport industries. Please help our businesses by visiting their websites. AdMax is a web directory that is available to help almost any business in England, Scotland, Wales, Northern Ireland, and Ireland (Eire). Applications for listings will only be processed after a one-off payment has been made for each category. AdMax will then send you an E-Mail asking for the details for your listing. Payment for listings is by PayPal or Credit Card on the Ezi Sales web site. Web sites that are poor quality or contain offensive material will not be listed! £8.00 + VAT Standard Listing - One advert including title, description, web link in one section of AdMax. £8.00 + VAT Extra Listing - Same as Standard Listing, in an extra section of AdMax. £16.00 + VAT Enhanced Listing - Listed above Standard Listings, with customer logo. Send us logo to be added. £24.00 + VAT per year Mini Web Page + Enhanced Listing. See sample page. £40.00 + VAT per year Full Web Page + Enhanced Listing + E-Mail (your_name@admax.co.uk). The content and images for the web page supplied by customer, but enhanced by AdMax for presentation. See sample page. AdMax is part of Kielder Connections Ltd, an information business based in Epsom, Surrey, England.